From the N3 Johannesburg take the N2 North Coast/Stanger feed - off(outer ring road) travelling North (plus minus 15km), take the Umhlanga Rocks/Mt.Edgecomb/ Phoenix feed - off to your left - at the fraffic light take the Umhlanga turn to your right - pass the Umhlanga Ridge/Gateway/La Lucia Ridge feed off - take the Umhlanga Rocks Drive/Gateway/La Lucia Ridge feed - off to your left - take the Umhlanga feed - off to your left - at the traffic light take the slip way to your left M12 Umhlanga Ridge/Umhlanga Rocks into Umhlanga Rocks Drive. Follow the road past Umhlanga Rocks Hospital - past the first circle - at the second circle turn towards Umhlanga (you will see the sea) into Lighthouse Road - follow the road over the M4 from Durban - at the fourth traffic light after turning into Lighthouse Road turn to your left into Chartwell Drive - it becomes Lagoon Drive - follow Lagoon Drive to number 82. 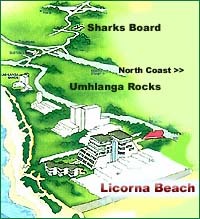 From Durban, travel on the M4 past La Lucia and take the Umhlanga Rocks feed - off Turn right at the traffic light over the freeway and turn left into Chartwill Drive - it will becomes Lagoon Drive - follow Lagoon Drive to number 82. .